A warm evening in colonial North America’s leading city. Smoke drifts across the city, and with it the sound of voices raised in anger, of shattering glass and splintering wood. A mob is rioting in the streets, enraged by the newest outrage from Parliament: a Stamp Tax . Houses are destroyed, royal officials are burned in effigy. And on a deserted lane, a young girl is murdered. Ethan Kaille, a thieftaker of some notoriety, and a conjurer of some skill, is hired by the girl’s father to find her killer. Soon he is swept up in a storm of intrigue and magic, politics and treachery. The murder has drawn the notice of the lovely and deadly Sephira Pryce, a rival thieftaker in Boston; of powerful men in the royal government; of leaders of the American rebels, including Samuel Adams; and of a mysterious sorcerer who wields magic the likes of which Ethan has never encountered before. To learn the truth of what happened that fateful night, Ethan must recover a stolen gem and sound the depths of conjurings he barely understands, all while evading Sephira and her henchmen, holding the royals and rebels at bay, and defending himself and those he loves from the shadowy conjurer. No problem. Provided he doesn’t get himself killed in the process. Thieftaker, available from Tor Books in hardcover, paperback, and all e-book formats, is the first volume in the Thieftaker Chronicles, the historical urban fantasy from D.B. Jackson. 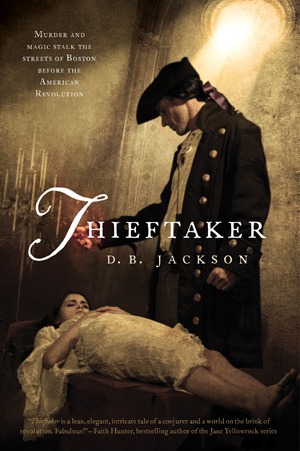 Combining elements of traditional fantasy, urban fantasy, mystery and historical fiction, Thieftaker is sure to appeal to readers who enjoy intelligent fantasy and history with an attitude. It can also be purchased in audio format from Audible.com.